Since 2009 a new methodology unites developers and system administrators. This technique is called DevOps and it is targeted to organize the development process for quick and quality release. Our company attempts to stay tuned and follow new tendencies in software development. Obviously, DevOps is explained as development + operations. Its main goal is to automate and standardize processes for application lifecycle, including designing, development, testing, deployment, support and monitoring. This implies that DevOps engineer is a professional who combines these two specializations. Usually, it is more common to find a developer who is interested in deployment too or a system administrator who has passion to coding. But today more and more often we can find the term "DevOps engineer" when it comes to understanding both server management and application development. 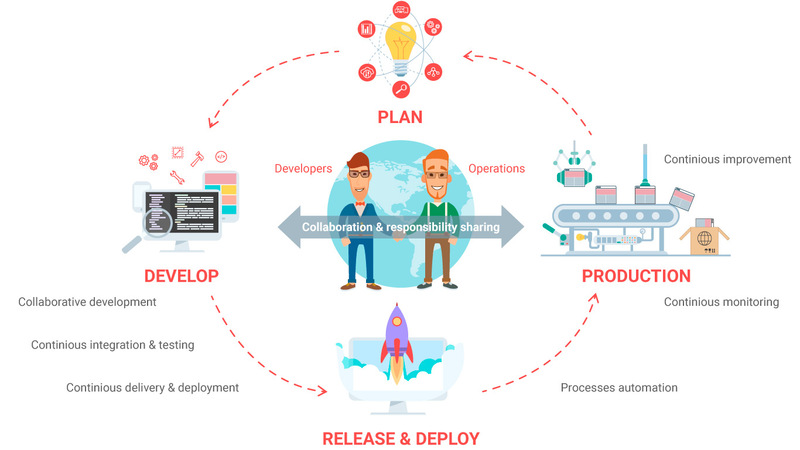 The main goal of DevOps is to organize software development environments, physical environments, collaboration of teams and processes in such way to ensure the rapid, frequent, and reliable release of the new software. At the designing stage, DevOps engineer helps to identify the infrastructure requirements. During the development and testing, they are occupied with deployment, integrations, and load (stress) testing in order to find out if the software environment is ready. However, DevOps engineers do not usually work on the project from scratch. To be more precise, they collect the information about the initial changes to existing code versions. While working with already existing code, they obviously must be proficient in languages this code is written in. And further, if there any system administration needs or testing is required, DevOps architect must understand these niches as well. Most commonly, DevOps engineers must understand the code well, so they could review the existing code, make changes if needed, improve it as per client’s needs, deploy it, apply automate testing, assure seamless release and updates. How can you benefit from our DevOps approach? Creating and maintaining development platforms and processes that enable automation of builds and releases. Collaborating with development, infrastructure, and QA teams to drive productivity, repeatability and quality improvements. In DevOps there is a big variety of instruments which are used for quick, relatively easy and efficient processes monitoring and automation. Daresay, DevOps establishes the work of development, operations and QA departments, it also informs about any alerts or issues in the software. DevOps engineers try to create new instruments for these specialists including creation of VM, additional services for its monitoring, etc.